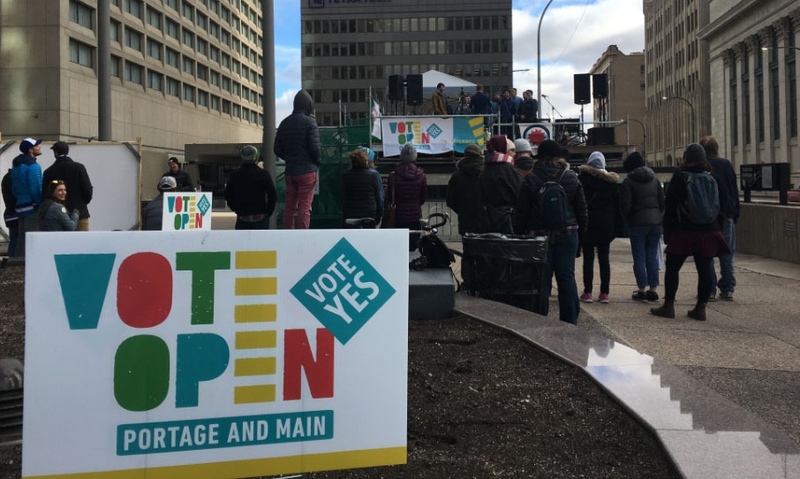 The people behind Vote Open, a campaign created to support the opening of Portage of Main to pedestrians, are holding a free concert just a few days before Winnipeggers head to the polls. OpenFest is a festival with local musicians, artists, food and drinks being billed as a way to celebrate the iconic intersection. It runs from 2 p.m. to 11 p.m. on Saturday at Richardson Plaza and 201 Portage. 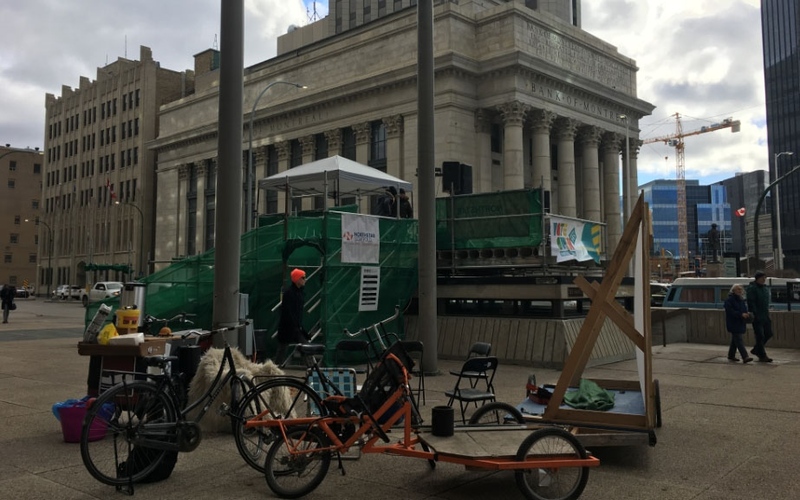 “It’s so encouraging to have the support of the local musicians and business owners who bring so much culture to this city,” said OpenFest concert organizer Anders Swanson in a press release. The concert will include performances by Royal Canoe, Mahogany Frog, JP Hoe, Sweet Alibi, members of Red Moon Road, local DJs and more. The Purple Room will also be hosting an open mic from 5 p.m. to 9 p.m. Admission is free, but Vote Open is accepting donations for the Children’s Rehabilitation Centre at Richardson Plaza. Festival-goers are encouraged to walk, bike or take Winnipeg Transit to get to OpenFest. All vendors are donating a portion of their services. Portage and Main was closed to pedestrians more than 40 years ago. A City of Winnipeg consultant report said it could cost the city at least $11.6 million to reopen the intersection. Coun. Jeff Browaty has been a vocal opponent of opening Portage and Main. He believes it will be too costly and the impact on traffic will be too severe. “11.6 million is the absolute most basic version of an opening,” he said Saturday. Browaty said some versions of the plans to open the intersection haven’t been costed out and there will be annual costs as well. “Annually to keep transit service levels even at status quo, we’re looking at $1.8 million,” he said. Browaty said Winnipegger want a vibrant downtown but Portage and Main doesn’t need to be open for that to happen. The result of the ballot question is non-binding. An example of what the ballot looks like can be found at the City of Winnipeg website. On Oct. 24 polls will be open in Winnipeg from 8 a.m. to 8 p.m.